Rick and Morty Licensing Program Grows With New Partners And Swag! Get Ready for Cool Geek Swag as Rick and Morty Licensing Program Broadens with New Partners! Cartoon Network Enterprises has announced the growth of the Rick and Morty licensing program. With more than a dozen new partners, a diverse range of products will be available for fans of the popular Adult Swim series. The items will include home decor, apparel, accessories, toys, and more. B&D Group will be launching inflatable furniture in November at specialty stores and pool floats will be released in the spring of 2019. Beeline Creative is introducing a Rick and Morty-themed Geeki Tikis collection this fall, featuring creative, colorful drinkware products. Additional houseware products will be introduced in spring 2019. An assortment of confections and beverages are being introduced this summer from Boston America. Several FYE store exclusives and additional items will be available at specialty. Briefly Stated will launch Rick and Morty underwear and sleepwear for men and women at mid-tier and mass this fall. Stance, an American sock and underwear brand, will offer Rick and Morty themed socks. Palamon will release a variety of Rick and Morty Halloween costumes and accessories across mass retailers, specialty stores, Halloween specialty stores and online retailers this fall. Accessory brand Loungefly will introduce a wide variety of Rick and Morty items including backpacks, bags, purses, wallets, hand and compact mirrors, lunch tins, beanies, luggage tags, keychains, cell phone cases and more. PopSockets is now offering a Rick and Morty line of the trendy phone accessory at Target, specialty stores, electronic stores, online retailers and the official website. 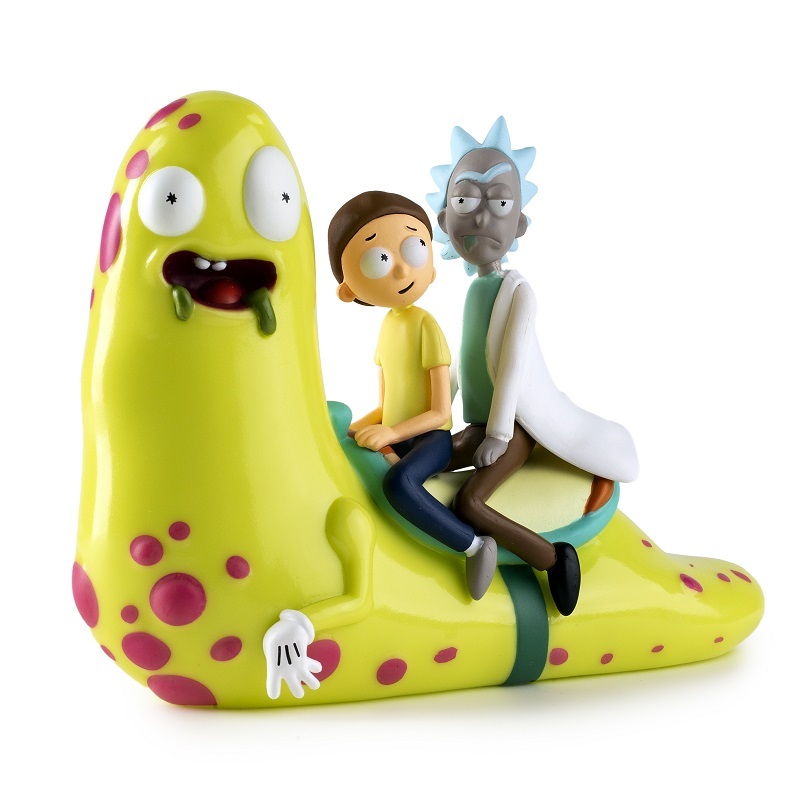 Just Toys is producing a line of Rick and Morty SquishMe’s available during the holiday season at mass retailers and specialty stores. Fuckjerry launched the Rick and Morty expansion pack of their popular “What Do You Meme” adult party game exclusively at Spencer’s stores this past July with expansion into mass starting in October. Here’s the synopsis for the show. Make sure to read our review! Rick and Morty is the critically-acclaimed, award-winning half-hour animated hit comedy series on Adult Swim that follows a sociopathic genius scientist who drags his inherently timid grandson on insanely dangerous adventures across the universe. Rick Sanchez is living with his daughter Beth’s family and constantly bringing her, his son-in-law Jerry, grand-daughter Summer, and grand-son Morty into intergalactic escapades. Can the family survive Rick’s insanity and all the chaos the universe throws at them? Three seasons (a total of 31 episodes) of Rick and Morty have aired. It was announced, Adult Swim ordered 70 new episodes, however, air dates haven’t been confirmed. Are you excited about the Rick and Morty licensing program partners and the new geek swag you can own? Let us know. Next: Garrett Clayton Comes Out As Gay On Instagram, Talks About His New Role In ‘Reach’, And More!